The College of Engineering annually honors faculty members for their teaching and research. The 2013 awardees were honored on April 24 in The Blackwell ballroom. In honor of John H. Lumley, a 1927 graduate of ceramic engineering, this team award was established in 2002 to recognize interdisciplinary research accomplishments of the college faculty and research staff. The Lumley Engineering Research Awards are presented to a select group of outstanding researchers in the College of Engineering who have shown exceptional activity and success in pursuing new knowledge of a fundamental or applied nature. Named for the late Dean of the College of Engineering, this award is presented annually to faculty members who have demonstrated, in a superior manner, their interest in and willingness to help students. The Honda-OSU Partnership Award recognizes an individual who has made significant contributions to promoting and strengthening this historic partnership. 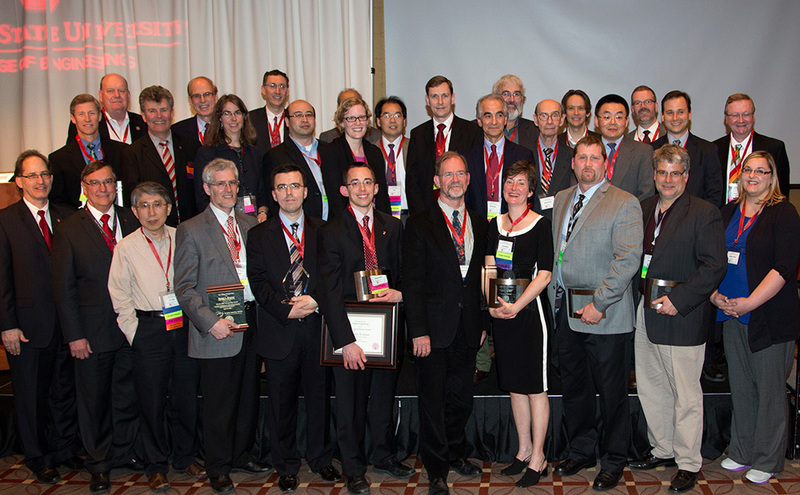 This award is presented each year to an individual or team of faculty and/or research scientists who best demonstrate innovation in the development of a product and/or technology originating from the Ohio State research enterprise. This award recognizes an individual or team demonstrating excellence and success in the development and implementation of models, strategies, practices and programs that foster and enhance diversity in the college. Named for the late Ralph L. Boyer, a 1924 mechanical engineering graduate, the award is presented to a faculty team or to an individual faculty member who has made outstanding contributions to the improvement of undergraduate engineering education. This award recognizes an individual or group from outside the Ohio State community for exemplary service to students of the College of Engineering or Knowlton School of Architecture. Dow Chemical was selected for its long-term dedication and continuous commitment in supporting learning, research and career opportunities for students by supporting key activities related to student development. This award is presented each year to a non-COE faculty member at Ohio State who demonstrates excellence and accomplishment in the development and implementation of collaborative activities and programs between his or her academic unit and the College of Engineering. This award recognizes the contributions of College of Engineering junior faculty and staff to create more innovative and effective teaching and learning. In honor of Peter Scott, a 1949 Ohio State graduate in electrical engineering who received an honorary doctoral degree in 1995, this award recognizes a senior faculty member who has achieved both national and international status as a leading educator and researcher. In honor of Stan Harrison, a 1958 Ohio State graduate in electrical engineering, this award is based on excellence in teaching and qualitative aspects of teaching, exceptional research, or a single or unique contribution to engineering or architecture concepts.